I bought this book to fill in the massive hole a Deitel book leaves in a college course. The two-page topic style is great. Others have commented on the Pros of this book in depth so I will only add that I have found no cons to date. I am looking into other Murach titles!" Beyond that, some instructors thought that the first edition was too difficult for programming beginners, and we agreed. For that reason, section 1 has been completely rewritten so it works for both beginners and experienced programmers. So, for those of you who used the first edition in your courses, the short answer to “What’s new?” is “Just about everything.” In section 2, you may recognize some of the best features of that section in the first edition, but even that has been improved with more examples and more complete applications. As we see it, if you liked the first edition at all, you’re going to find that this 2nd Edition is a dramatic improvement...in every way. Because this book was published in 2015, it doesn’t present all of the new features that are in the ECMAScript 2015 and 2016 specifications. If you want to include some of those features in your course, however, we offer a FREE PDF download called “What’s new with ECMAScript 2015 and 2016” that presents all of those features plus the Internationalization API. This PDF is both tutorial and reference, and it makes it easy for your students to add the new skills to their skillsets. Your students can access this download by going to the FREE Downloads tab on the book page on our retail site. And you can download this PDF right now. Although your students can use any text editor with this book, a text editor that includes syntax coloring and auto-formatting will help them develop applications more quickly and with fewer errors. In the book, we recommend Aptana Studio 3; however, it’s no longer supported and has become hard to install. To test a web page, your students can use the default browser on their systems. But we recommend that they also test their pages in Chrome, which includes a terrific set of developer tools. Appendix A provides a procedure for installing Chrome, and chapter 6 shows how to use Chrome for debugging. 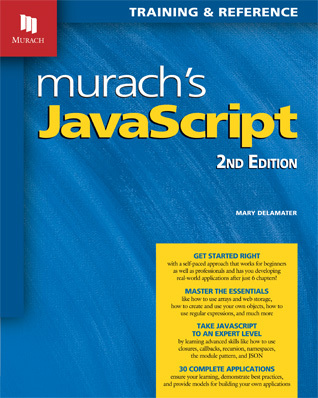 “This book employs the paired-pages format that Murach is known for: For each topic the right page contains a figure with example code, diagrams, tables and bullet points, and the left page contains the explanatory text. I like this format a lot because it keeps the book well-organized and makes it easy to refer back to….